Now that cuts are biting, people are desperate for an alternative, but Labour didn’t have the courage to provide it. Having eggs pelted at you seems almost a rite of passage for politicians, and if that’s the case Ed Miliband must be feeling pretty ministerial these days. Miliband fell victim to his second egging yesterday afternoon, a fate he deserved because – according to his assailant – he isn’t “standing up for the poor”. Whatever one thinks of egging as a tactic: the man has a point. It’s not just that Miliband isn’t standing up for the poor; it’s that often he doesn’t seem to be doing very much at all. I mean, who knows what Labour even believes any more? Take the benefits cap: when it was first announced, Labour promised to stand against it – a position that lasted all of five months until July of this year, when Liam Byrne decided that, on reflection, not only was the benefits cap acceptable but actually it was “too soft“. I’m going to generously assume that Miliband doesn’t think austerity is the right way forward: his tentative forays into anti-cuts rhetoric suggest as much, regardless of the many U-turns he makes later. The problem, in my mind, is not one of political ideals: Miliband simply isn’t brave enough to really push ahead with an anti-austerity message. I can understand why Miliband didn’t oppose the cuts when he first became the dear leader. At that time, the cuts were just an argument – it was easy for the public to accept them because they seemed distant and intangible, or at least they seemed like something that would happen to other people. Now they’re starting to bite, most people know somebody who has been made redundant, if they’re not getting made redundant themselves. The cuts are no longer an intellectual issue, but something that is happening on our doorsteps. Of course people will want to find an alternative. Labour could have been that alternative, but it simply wasn’t brave enough. So now, instead of a storming lead in the opinion polls, Labour is limping along like some kind of maimed animal, and the only thing the public seem to be feeling with any kind of fervour is a generalised resentment towards politicians. Anyway, people think UK Uncut is the bee’s knees now. Telegraph columnists write glowing articles about its achievements, its activists get courted by big companies desperate to avoid some bad headlines, people like me get invited on to Newsnight to argue about tax avoidance. But I remember a time when being in UK Uncut meant you got sprayed with CS gas, smeared by Boris Johnson on Question Time, branded an “embryonic terrorist group” by Michael Gove’s thinktank and denounced as violent by the very politicians who are now clambering to label tax avoidance “morally wrong”. Now opposing tax avoidance is de rigeur; most people have forgotten that the people who made it fashionable were originally dismissed as idealists. Similarly, the Labour party could have weathered the pro-austerity storm – and I doubt it would have been smeared with the terrorism brush. Eventually the tide would have turned because, and here’s a shocker, people actually quite like public services and having jobs. And then, ba da bing, Labour would have been ready to receive a load of disgruntled voters. But Miliband lacked the cojones, and because of that, we’re all lacking a political alternative. So now the leader of the opposition gets pelted by a frustrated man with eggs, because voting for a political party doesn’t seem to mean that much any more. Posted in: Activism, Economy, Labour, Macroeconomics, Outside Left, Politics, Public Spending. I’d hate to think this was the case but some numpty chucking eggs at a politician to me actually trivialises the whole issue – someone who does this is easily dismissed as some fringe nutter who is beyond the fringe mentally and socially. To underwrite this is a “manifestation of people’s frustation” leads us along the same route as the far left. Far better to embarrass politicians with difficult questions. 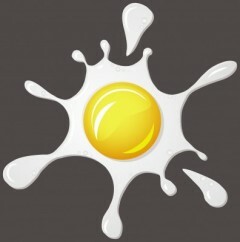 People will have forgotten the egging in a few weeks – people don’t forget a response. Think you’re over-egging (geddit?) the assailant’s level of political engagement. He attacked Ed for the Iraq War (Ed was against it) and said he would not vote for him but would voted for his brother (who supported the Iraq War).